Like many gardeners, we provide a couple of bird feeders in our yard. 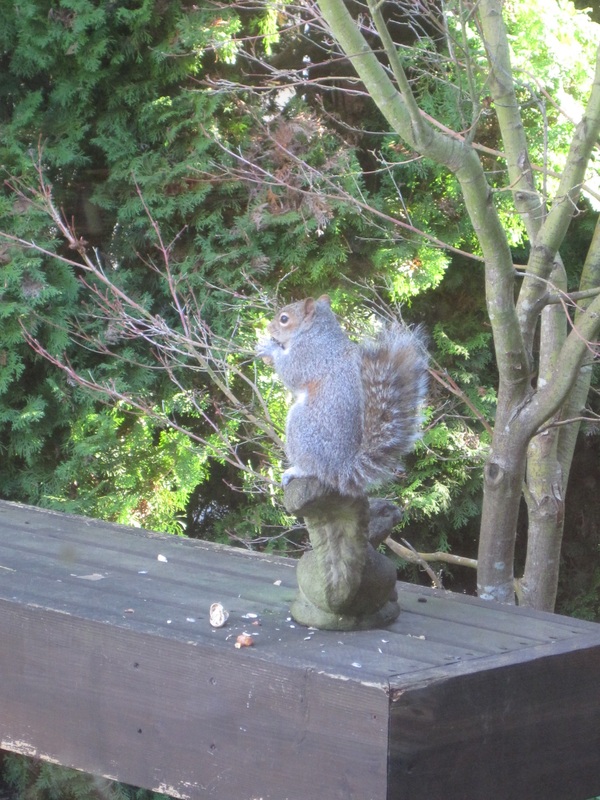 Along with the desirable birds, we get less desirable visitors like pigeons and squirrels. Having tried (and failed) to make our system squirrel-proof, I finally decided to wave the white flag and embrace our furry visitors with their own bowl of treats – raw peanuts and sunflower seeds in the shell. We put this on our deck next to the sliding door so our cats can enjoy the show. Cat TV is very popular viewing at our house. 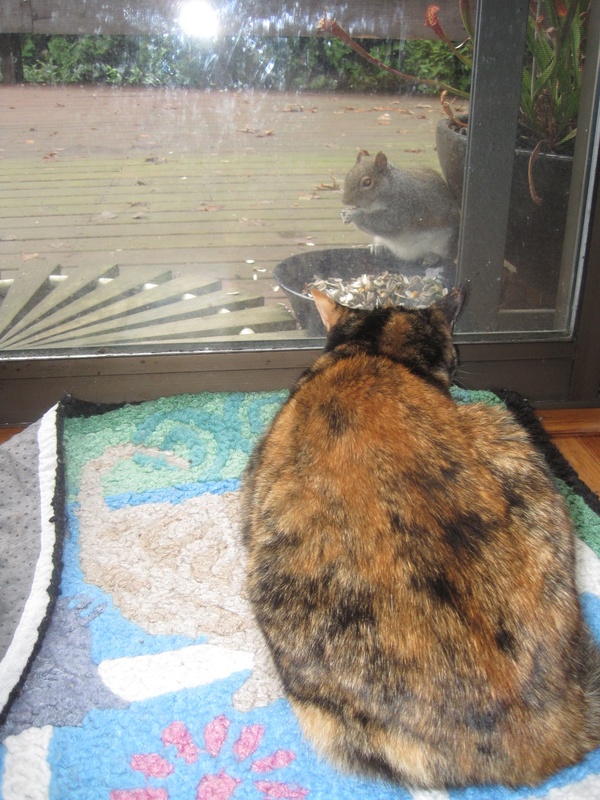 A completely unexpected benefit of Cat TV is that the squirrels no longer dig up my bulbs and gnaw at them. 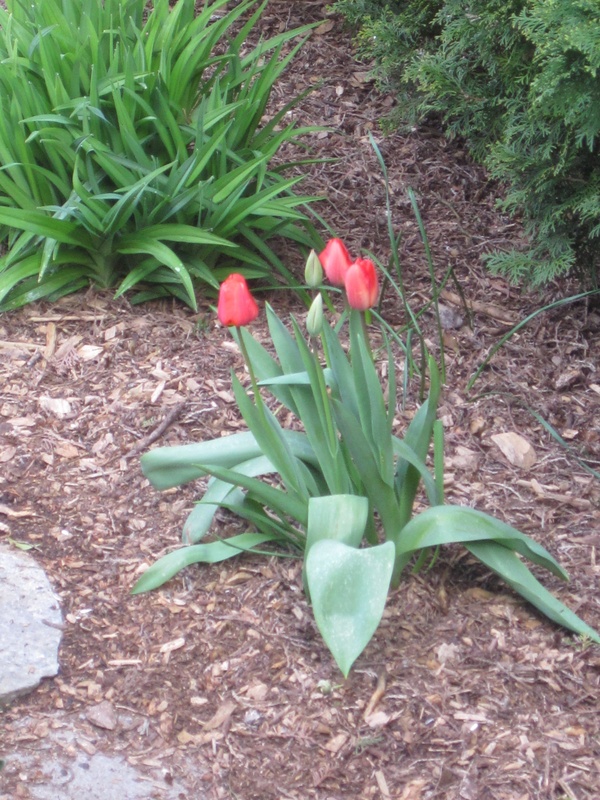 Nor do they destroy my tulip buds. In fact, for the first time ever my tulips are intact and gorgeous. It finally dawned on me that I could prevent the squirrels from eating the magnolia buds if I put a ring of sunflower seeds around the tree to intercept them. I also put lettuce scraps around my newly sprouted garden greens to feed the slugs before they get to what I really value. Thanks for a delightful piece. Live and let live! Have you considered the possibility that this may be lead to longer term problems? If you feed the squirrels all they want, then you may set off a squirrel population explosion. They will need more and more food. If you give them more food, then more squirrels will result in a cycle that repeats until the situation becomes intolerable??? I could be wrong, but I am certainly not going to try this with my rabbits. The squirrels are here, regardless of what we provide them. There is an abundance of bird feeders in the neighborhood in addition to natural food sources. 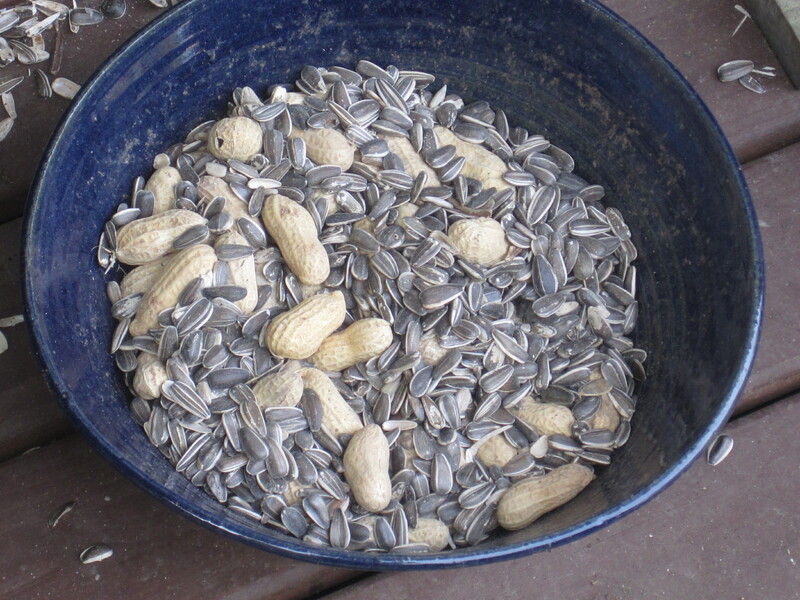 Our small addition of a weekly bowl of peanuts and sunflower seeds is not likely to create a population explosion. But it does keep our plants free of damage, which makes it worth our while. You are already doing it . . . with your garden. After seeing the damage last year from the rabbits, I tried feeding them this winter. They still ate my roses, magnolia, and serviceberries down to nubs. Pigeons . . . hummmm, maybe you should let the cat out.